Thousands of anti-abortion advocates have descended on Washington DC for the annual March For Life demonstration at the National Mall. 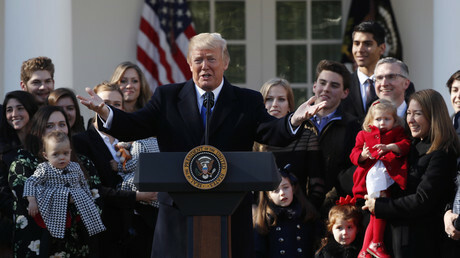 President Donald Trump addressed the crowd Friday, becoming the third sitting US president to do so. Trump, who spoke via satellite from the White House Rose Garden, followed a precedent set by his Republican predecessors Ronald Reagan, who spoke via telephone in 1988, and George W Bush, who twice did the same in 2003 and 2005. The event was founded by anti-abortion activist Nellie Gray in 1974, to protest the first anniversary of the passing of Roe v Wade – the Supreme Court’s decision to legalize abortion nationwide. The annual gathering has grown from an estimated 20,000 in its first year, to a reported attendance of 650,000 in 2013, according to Fox News. According to the latest Gallup figures, 50 percent of Americans said abortion should be legal under certain circumstances. Some 29 percent said it should be legal under any circumstance while 18 percent said it should be illegal in all circumstances. Support for some kind of legal abortion has remained steady at around 50 percent since the passing of Roe v Wade.